You are here: Home / Family / It’s Mother’s Day, and, oh hey, I’m a Mommy! It’s Mother’s Day, and, oh hey, I’m a Mommy! It’s been 18 months since I gave birth to the twins and I’m first to admit that the idea of myself becoming a Mommy took a while to sink in. And yet, somewhere in the midst of changing diapers and giving warm baths and witnessing two little humans grow (too fast, I must add), I find myself learning to embrace this (new) role with eyes and arms wide open. I’m a Mommy, and I love being one! 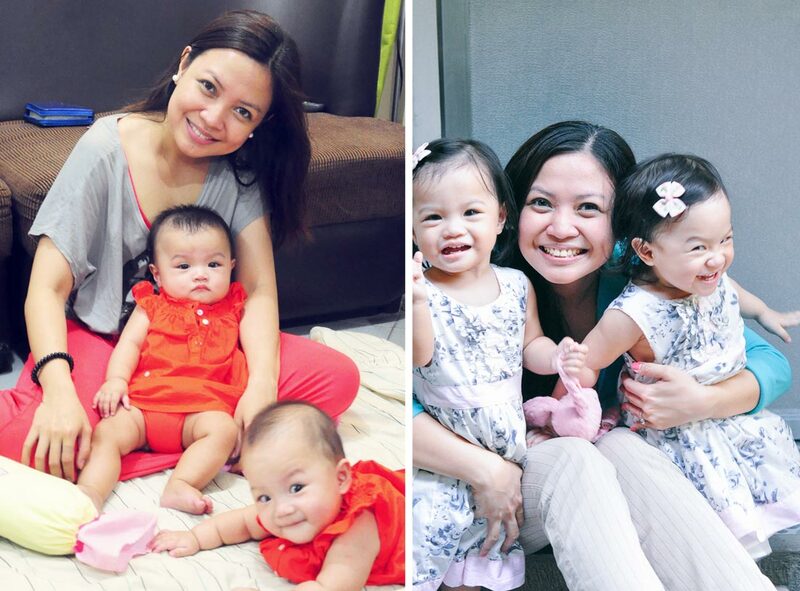 Left: Taken on Mother’s Day last year; Right: From last month, see how fast they grow?! The thing is, I was never motherly. Sometime a few years ago, a cousin of mine predicted that I’ll be the last one in my batch to settle down and have kids. I don’t know what made him say it, and I didn’t exactly contest—I knew that I didn’t fit the Mommy profile. Maybe because I was horrible with kids. Maybe I wasn’t the type to settle down in one place and it showed in the way I restlessly moved from one place to another when I was younger. Or maybe I was too preoccupied with my career at that time that it didn’t look like I had time to pursue having a family. Or could it be that I feared becoming a mother that I subconsciously pushed it at the back of my mind? I go over the bucket lists I made when I was younger and find that I never once listed or dreamed of becoming a Mom. Never. Like, it just never crossed my mind. I know of friends who believed in their hearts that they’re going to become mothers someday, and they did become mothers and they’re awesome at it! As for me? I wanted to be successful in my career, go places (New York, check; Sydney, check; Italy, maybe someday), buy this and that, find The One, get married before 30, establish a passion business, have my dream wedding.. and, the list kindof stopped there. In retrospect, how can I not have dreamed of becoming a mother someday when it’s one of the best things that’s ever happened to me now? It’s like The Dream I never knew I had! All these years being unsure of what I want, or what my dream job is, or where I want to go next.. Suddenly, one thing is certain. I’m a Mommy, and God called me to be one when He blessed me and my husband with these two beautiful little girls. And I learn over and over again that no matter how inadequate one feels about a role, God is the one who equips her to be the best person for it. Surprisingly for me, nothing—no job or hobby or dream—has ever been more fulfilling than this. Epic, I must say, and we all know that the word “epic” is not to be used lightly. And before I end this monologue of sorts, I just want to throw a little shoutout to my fabulous Mom who modelled and taught me unconditional love, who raised me to be who I am today, and who remains to be as beautiful and as amazing as ever.